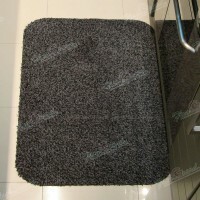 Magic Mat is excellent at absorbing dirt, oil and water. Magic Mat greatly reduces clean up by grabbing dirt at the door and protecting floors and carpets from damage caused by mud, dirt and dust. Magic Mats are fully machine washable and pre-washed for superior absorbency. In fact, more washing improve Magic Mats functionality even further. Magic Mat is a big helper around the house. These mats are the best I have ever owned. I don't know how they work but they do! When my puppies walk across the mats from coming indoors they magically wipe their feet. Same works for people too. I don't have to ask people to take off their shoes at the door now. I will be buying more for Christmas presents...cause they work! I ordered these mats as I got fed up with all the pine needles getting tracked all over the house, and our toddler runs straight in in muddy boots etc. I am amazed at how well these mats have reduced the dirt and debris in our hallway, even when little ones aren't wiping their feet. Price is great seeing as you get two, and they look much nicer than the average doormat. I bought these mats for my son and family. They have a greyhound dog and 3 boys. The mats do not slip and slide all over the floor . They are big enough for the dog to stand on and get all 4 paws dry at once. This is my third mat and I am thinking of getting another one in this size. It works well at every entry way and is easy to keep clean. I washed my smaller ones and they clean up very nicely. The reason I gave these mats a 4 is because of the odour. I did put it out in the freezing weather for a couple of days (it snowed on them too) and it did reduce the odour. Would be nice not to have it at all. All in all the mats are very workable in our house. 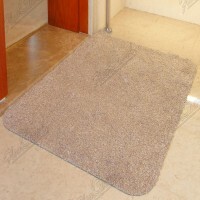 I purchased two of these mats in beige over 3 years ago - I ended up using them in my office at my main door - they are fantastic - over 3 years in a high traffic area all year long (snow, rain, etc) and they still are going strong - they wash beautifully, they absorb so well! I have gone through numerous mats in the meantime next to them as I did not have a large enough mat to cover the whole front area. I finally got around to purchasing more for my home and other places in the office. Well worth the investment!! Got my set of charcoal and put one by front door. Besides my long haired Siamese/Himalayan cat Zeus loving them, they are great for foot traffic AND Zeus's and my other 3 cats hair. It keeps the hair from flying everywhere like it used to and I think I will get another set in the other colour. I planned to use 1 for around the litter box, but waiting to use my spin mop to really clean up before I put it down. Wondering if maybe I should wait and put the lighter one down when I get it since the litter will probably show up a lot on the dark one. Haven't washed this one yet so no help there, but they are great as advertised and surprisingly soft. Great item!! !